Welcome to The Holiday Home Series at The Yellow Cape Cod. Today, I finished up our 2011 Christmas mantle. 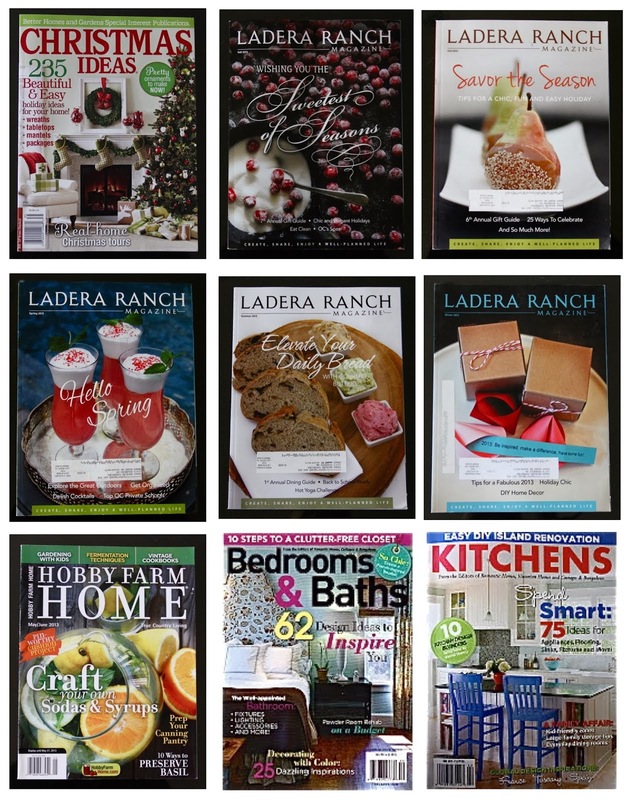 It began with our stockings from Ballard Designs. Yesterday's post was dedicated to the art of hanging stockings and how to get them to hang straight. Please (click here) if you would like to read more. The reindeer antlers were a summer garage sale find. I gave them the glitter treatment with Krylon gltter blast spray paint. I've have been waiting 6 months to see them on our Christmas mantle. That makes me sound kinda crazy, doesn't it? If you would like to create your own glittered reindeer antlers, please click here for a simple tutorial. 1. First, I gathered fresh greens from the front yard and wove them loosely around the antlers. 2. I added faux leaves for interest and variation in texture. 3. 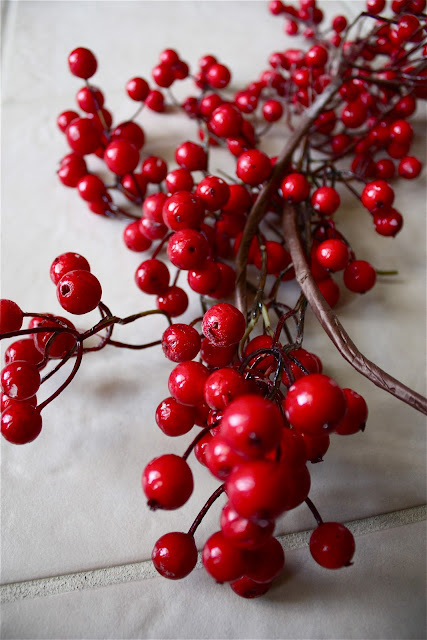 Glittered red ornaments and faux berries added a bright pop of color. I absolutely love the antlers! What a great touch! Ahhhh...so very pretty!!! 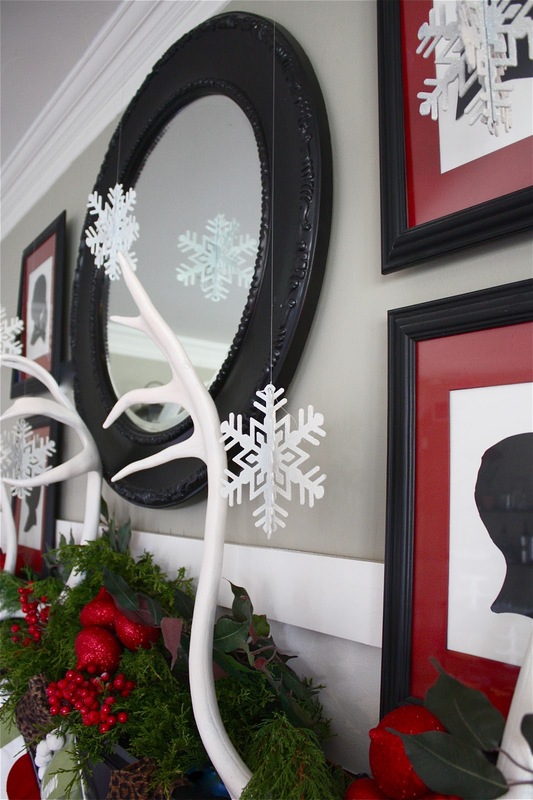 Love the snowflakes and the antlers. Am really enjoying your Holiday Home Series. Sarah, this is exquisite and should be in a magazine. I love everything about it! Sarah, You mantle is so happy, festive and so unique! I love those antlers! I would have grabbed them up too! Wonderful! 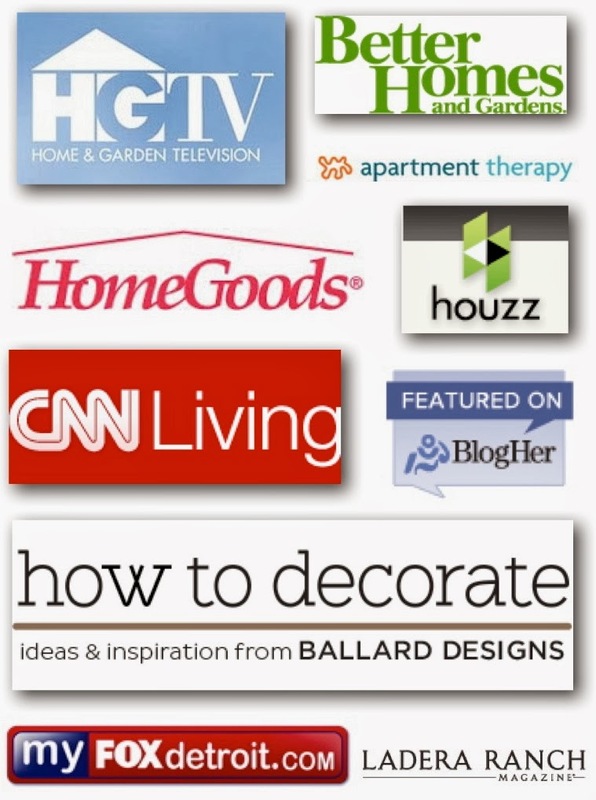 I have been perusing yours oh, so inspiring blog and am a new follower. You are also going on my side bar so I can visit often! Absolutely beautiful!! I love it!! Great job! This is beautiful! I so wish we didn't have a huge TV over our mantel so I could do cool things like this. Simply lovely. Went to the Dollar Tree and they didn't have the 3d snowflakes...when did you purchase them? This is the most beautiful mantel, hands down, that I have ever seen. gorgeous! So modern and playful. love those snowflakes the best, and the reds really pop on the black. gorgeous! love the stockings and antlers! 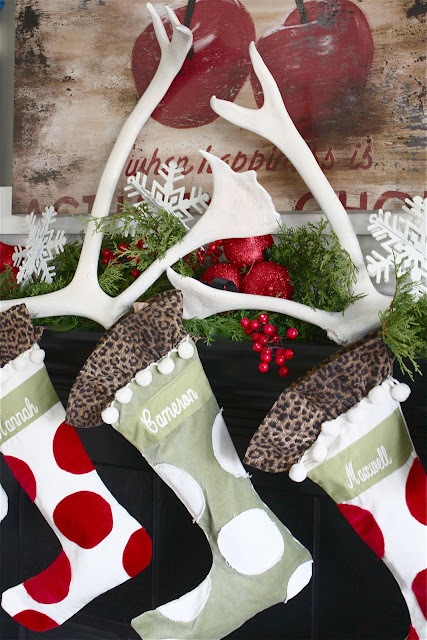 I LOVE the stockings with the leopard accent! This is so bold and graphic...a real stunner of a mantel! Good grief I love this mantle. 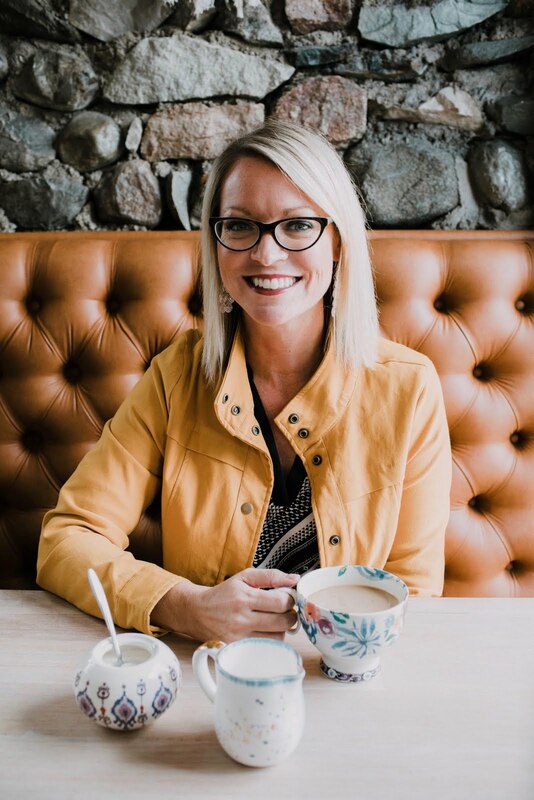 Everything about it-you did a beautiful job layering textures and I'm a teensy bit obsessed with those antlers!New follower, so happy I found your blog! Dying...in a good way! Ballard and sillouettes, fabulous!! Great job. I just love your mantel - it makes me smile. 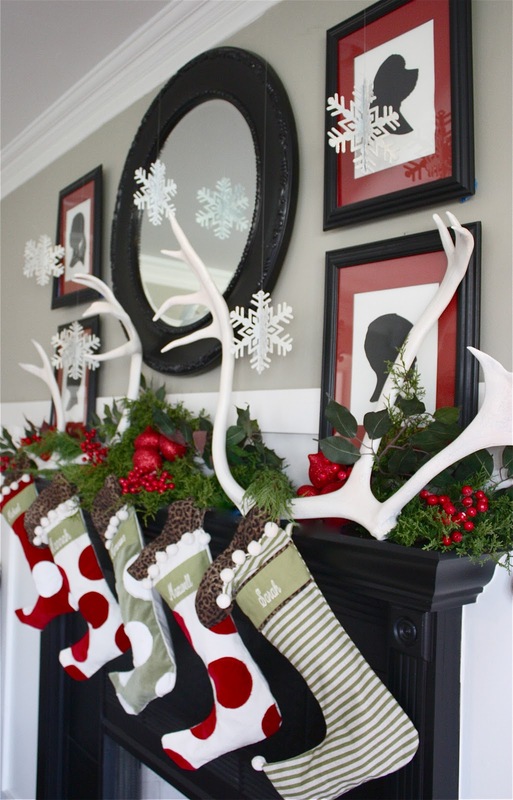 The stockings, the snowflakes, the antlers - love it all! Beautiful! 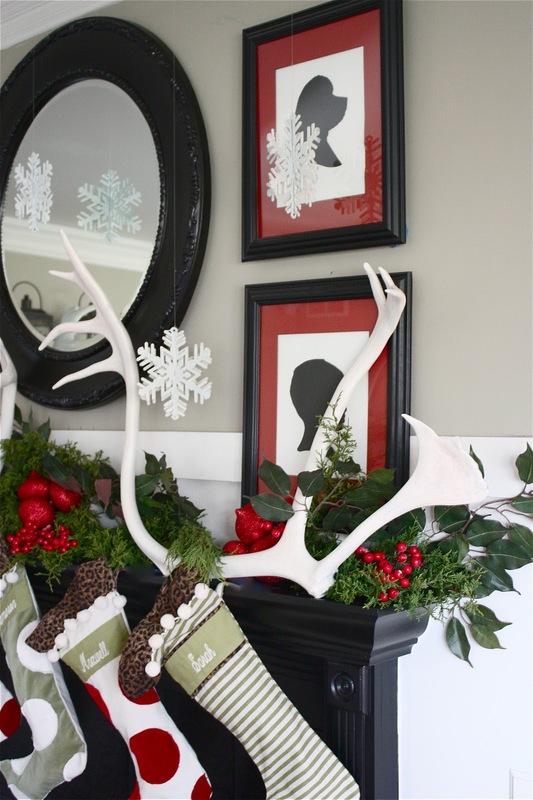 I love your combination of colors and the addition of some bling and personalized touch with the antlers. Very nice! Love the antlers!! I want some in my home. You mantle is fabulous!!! I absolutely love those antlers!! I'd love for you to link up to my first Holiday Party!! This is amazing - really stands out! Love the antlers (no, you're not crazy to wait excitedly for 6 months to use them!) and the silhouettes with the red matting. The stockings are similar to mine too! Great job and following along. Ohhhh, the antlers are fabulous. I also love the red mats on your silhouettes. Very pretty! So fun and festive! The colors and textures are fabulous! Merry Christmas! Just wanted to stop back and say I pinned this and linked it on my FB page - just love it! So pretty! The black and red are striking! Absolutely love it! Those antlers are just precious. And the polk-a-dot stockings are so cute against the black fireplace. Job well done! 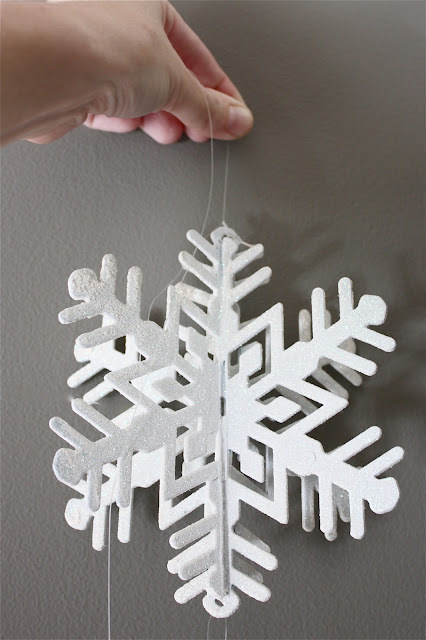 I'll be featuring you in my favorite picks from the mantel link party! Beautiful. I love those silhouettes! Great job on it all. I love this mantle on so many different levels! 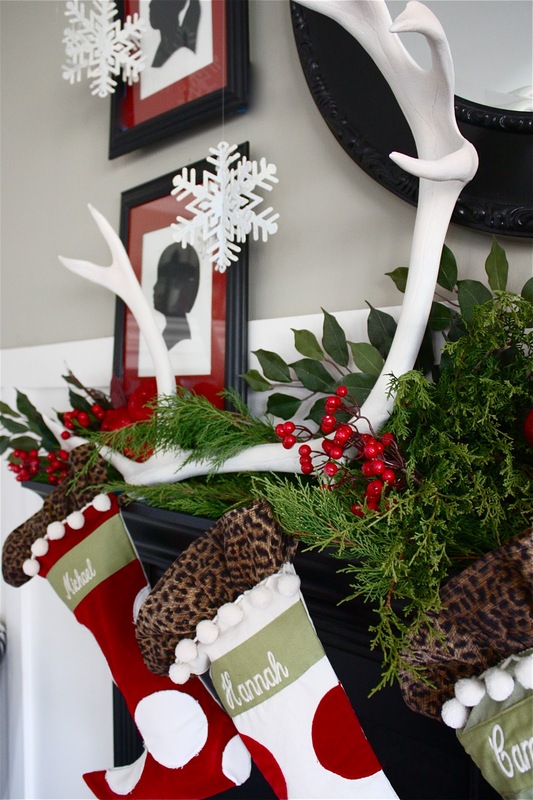 From the antlers to the framed silhouettes to the fun stockings .... Just beautiful! Your mantel is absolutely lovely! I think it is really fun that our mantels combine so many similar elements, but with the different color schemes, they have totally different effects. Terrific job! LOVE your stockings!! Everything looks great!!! I need to get to the Dollar Store for those snowflakes!! Love your mantle! So elegant and well done. :) Your stockings are adorable! Absolutely amazing and so festive for the eyes! You chimed in a black fireplace perfect with this one! I have to admit, I am feeling a bit envious right now. FANTASTIC job! :) Following you now..and on FB. That is amazing! My husband hunts, so he would be in heaven with a mantel like this. I adore the antlers!!! I would love for you to show it off at Find YOur Craft Friday!!! What a fantastic mantel! We'll be featuring you over at www.TheRoosterAndTheHen.com tomorrow as part of our 12 Days of Unique Christmas Decor - thanks for making an awesome mantel! Anyone know of a good tutorial for the silouettes? Those look so great!! Beautiful decor!